What are the most popular starter necklaces? One 5mm, 5.5mm, or 6mm Cultured Pearl on a 14k yellow or white gold chain. Can I add the pearls myself? We do not recommend that you add pearls yourself. Adding pearls properly is a skill that requires expertise as well as specific tools and a special silk thread. When our pearl specialist adds pearls, the entire necklace is taken apart. This is to ensure the best aesthetic position of each individual pearl, proper reflection of each pearl's luster, pearl roundness, as well as the exact millimeter size for perfect positioning. Does the Starter Necklace come with a clasp? Yes, every necklace comes with a clasp. The standard clasp is a jump ring and spring ring which is found on most pendants. 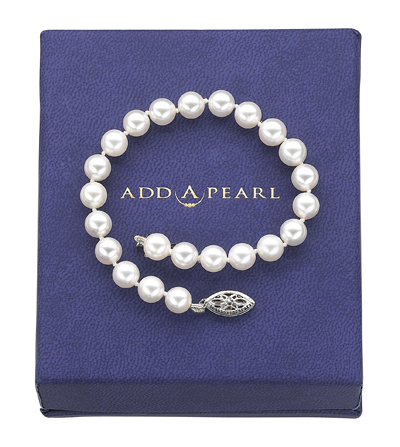 The Add-A-Pearl trademark is stamped on every clasp. Clasps can be upgraded at any time if desired. Here is a photo of the standard clasp. How do I add new pearls to my necklace? The traditional way is to order pearls online and have them sent to you in an Add-A-Pearl gift box. When you're ready, fill out the Send In Necklace Form and send the pearls and necklace to us for stringing. We recommend shipping with insurance. A faster option is to use our "Pearls on Hold" service in which you purchase pearls online, but rather than having them sent to you, we will set them aside until your necklace arrives. Simply fill out the Send-In Necklace form, wrap your necklace and ship it to us using UPS or your preferred shipping method. When we receive it, we'll add the new pearls and ship it right back to you. If desired, we will send the gift recipient a notification that pearls have been specially reserved for them in a gift box along with a padded envelope, shipping label, and instructions to safely send their necklace to Add-A-Pearl for stringing of new pearls. How should I send the necklace and additional pearls to you for stringing? Option 2: You may also call customer service representatives at 855-392-6640, who will be happy to help with your necklace and pearl additions. How long will it take to have pearls added? Once we receive the package, it takes approximately 2 days for us to string the pearls. Allowing for time in transit (UPS or FedEx) adds another 3-4 business days. Can the pearls slip over the chain to be added to the necklace? No, in the finest pearls the drill hole is so small that only a piece of silk thread can fit through the pearl. This is done to maintain uniformity and durability of the pearl's structure. The chain is then adhered to the silk thread stabilizing their position on the necklace. Should pearl additions be the same size as the pearls I started with, or should the pearls be graduated sizes? The pearls used in a necklace can all be the same size; or they can be graduated with a larger pearl in the center and successively smaller pearls running back to each side to the clasp. Either way, it is a matter of personal preference. To create a graduated style necklace, choose a starter necklace with one pearl on the chain. Then click on Additional Pearls and add as many pearls of different sizes as you want on the necklace. Add them to your cart. At checkout, use the comment box to specify that you want all the additional pearls put on the necklace. A Natural Add-A-Pearl necklace is most often created using graduated sizes. Cultured pearl necklaces are created either uniform or graduated and you don't have to decide which style you prefer right away. In the future, we can always graduate a necklace that has been started with all uniform sizes by simply adding larger and smaller pearls to the necklace. Our pearl experts will gladly assist in properly graduating your necklace when you are ready. If you are interested in creating a custom styled pearl necklace please call us at 855-392-6640. One of our expert jewelers will help guide and execute your custom selection. 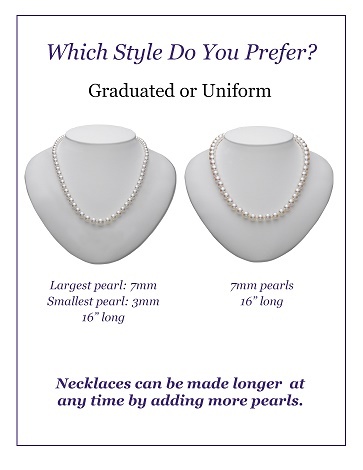 Can you recommend which pearls to add in order to create a graduated style cultured pearl necklace? A typical 16" graduated necklace consists of the following pearls: (1) 7mm, (4) 6mm, (10) 5.5mm, (14) 5.0mm, (12) 4.5mm, (18) 4.0mm, (18) 3.5mm and (8) 3.0mm. The completed necklace will have 85 pearls. For more suggestions please call one of our pearl specialists for assistance Toll Free 855-392-6640. Are the pearls individually knotted on the necklace? Necklaces of more than 10 pearls are knotted between each pearl to prevent the pearls from abrading each other and to minimize losses if the necklace should happen to break. The starter necklaces (of 10 pearls or less) are left unknotted because they lie more naturally on the neck. What is the cost for re-stringing my Add-A-Pearl necklace? Re-stringing or adding new pearls to your Add-A-Pearl necklace is a complimentary service if the starter necklace and all additional pearls were purchased directly from us. All of the additional pearls should be on an original Add-A-Pearl card. You will only be charged for return shipping fees ($6.95) incurred. If you would like to have your necklace restrung please contact one of our customer service representatives at 855-392-6640. We can help you with how to send us your necklace. If your pearls were purchased elsewhere, a stringing fee will apply based on the amount of time needed and number of pearls involved. How many pearls should be added at a time? Pearls can be added one at a time or several at a time. It is entirely up to you. Keep in mind that most necklaces will look best with an uneven number of pearls. This ensures that there is a center pearl. As pearls are added, an uneven number of pearls hangs more naturally and has better symmetry aesthetically. Will the necklace get longer as I add pearls or will the chain be cut to maintain the original length? 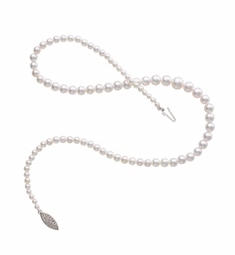 For optimum beauty, we recommend cutting the chain as pearls are added to maintain the original length (16”). This is standard practice for all Add-A-Pearl necklaces. If you do not want us to cut the chain down please contact a customer service representative at 855-392-6640. If you choose to keep the chain, as pearls are added, the necklace will become longer. For example, if you add 4 inches of pearls to the 16” chain, the total necklace will become 20” long. I started a Natural Pearl Necklace. How do I know which pearls to add next? We recommend following the pearl necklace plan available here.The plan has been specifically designed to assure a properly graduated, proportioned necklace and to create an elegant balance. If you are interested in creating a custom styled pearl necklace please call us at 855-392-6640. One of our pearl specialists will be able to help guide and execute your custom selection using pearl sizes of your choice. Do you have verification on the necklace to show that it is an original Add-A-Pearl product? The Add-A-Pearl name adorning the clasp is your assurance that we stand behind the authenticity and fine quality of your necklace. Add-A-Pearl® has been in business since 1854 and is the nation’s largest single user of natural pearls. Can I make an Add-A-Pearl bracelet? Yes, we are happy to make you an Add-A-Pearl bracelet. Please contact us at 855.392.6640 and we will gladly help you. What does the standard clasp look like? 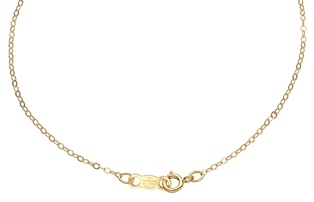 The standard clasp is the basic clasp found on most necklaces. It is simply a spring ring and a jump ring and looks lovely with the delicacy of the starter necklace. At any time, you may change or upgrade to a fancier clasp if you choose to do so. I don't understand mm sizes. What's a common object that I can compare the pearl sizes to? Here are some common objects to help you visualize mm sizes: The shaft of a Q-tip is approximately 2.5mm, the opening of an ordinary drinking straw is 5mm, the numbers on a credit card are 5mm, and a pencil eraser is approximately 7mm. What if I don't ever finish the necklace? Part of the beauty of Add-A-Pearl is it transcends generations. Necklaces in progress have unique beauty of their own We often see necklaces that have passed through several generations before they are completed. If you received a necklace from a previous generation, we recommend adding one of our charms engraved with a name and date to capture the time spent with you. Do Natural and Cultured pearls look alike? Yes and no. Both types are round, organic, fine gems from oysters with creamy color tones. Cultured pearls, however, are the traditional type of pearl we think of brides wearing on their wedding day. They are more perfectly round and have a shinier luster than natural pearls. Natural pearls are rarer and more unique. Since they are completely natural, with no assistance from man, natural pearls tend to be smaller and less perfectly round with a more matte-like luster and vintage appearance than cultured pearls. We think both types are truly beautiful!. How do I know what the quality is? All pearls used for Add-A-Pearl necklaces and pearl additions are the absolute finest quality. They are fine gems meant to create a special piece of elegant jewelry. Our cultured pearls are Akoya ( not Freshwater) cultured pearls known for their high luster, perfect roundness, and lack of blemishes. We have a full team of pearl specialists dedicated to making sure your Add-A-Pearl necklace looks stunning! Do you have pictures of the completed necklaces? Here are pictures of the completed necklaces.